A clouding of the lens of the eye, usually caused by aging, trauma, corticosteroid use, and/or radiation. Most cataracts develop as part of the aging process, but may be present at birth (congenital) or result from an injury, systemic disease (diabetes), or corticosteroid use. Using specialized equipment, cataracts as well as other eye diseases are diagnosed during a complete eye examination. The mere presence of a cataract does not indicate the need for surgery. Some cataracts may be slow growing, and for a period of time, stronger glasses can correct vision. Some cataracts develop more rapidly than others, and your eye doctor can monitor changes in vision and cataracts with periodic eye examinations. Dr. Johanna Jensen perform a type of cataract surgery called phacoemulsification. This surgery is minimally invasive (usually no need for sutures) and requires only topical anesthesia (eye drops) with IV sedation. In phaco surgery, a tiny incision (2.7 mm or less) is made in the cornea and a small ultrasonic probe is inserted to emulsify, or break up the cloudy lens into tiny pieces. Then those pieces are gently aspirated, or vacuumed, from the eye. 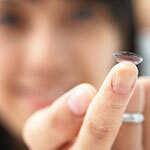 After the cloudy lens has been removed, a new artificial lens is implanted in the eye. Flexible intraocular lenses (IOLs) can be folded and inserted through the original surgical incision. Once moved in place inside the eye, the IOL unfolds to its proper shape. At Jensen Eye Associates, we use the Zeiss IOL Master®, a high-precision instrument revolutionizing all previous techniques and setting a new standard for the measurement of the ocular axis. This instrument gives the most accurate eye measurements possible to ensure success with cataract surgery. Because every person's eyes are unique, like fingerprints, it can be difficult to determine the appropriate specifications of the IOL to be implanted during cataract surgery. The Zeiss IOL Master now provides physicians with information on key ocular measurements such as axial length, corneal curvature and anterior chamber depth, making it possible to choose the right IOL for each patient. Approved by the FDA in 2000, the non-contact IOL Master is the only product in the world that makes these "optical biometry" examinations possible and has proven to be five times more accurate than traditional technologies such as ultrasound. Sometimes following cataract surgery, the clear membrane supporting the intraocular lens implant will become clouded. This condition is treated by using a YAG laser to make a small window in the cloudy membrane, allowing clear vision through the opening. This laser treatment is a painless outpatient procedure that only takes a few minutes. If freedom from glasses is your desired outcome, AcrySof® ReSTOR® may be your best choice. The AcrySof ReSTOR is a permanent artificial lens which is implanted in the eye to restore vision after the natural lens is removed, usually because of cataract. The ReSTOR lens is convex on both sides and made of a soft plastic. Following surgical removal of the clouded natural lens, the ReSTOR lens is folded and inserted into the eye through a tiny incision. The ReSTOR lens is like two lenses in one, one refractive lens is for distance vision, and the other one, a diffractive lens, is for near vision. In clinical studies, 80% of patients who had the ReSTOR lens implanted into both eyes reported they never used corrective glasses after the surgery. The AcrySof ReSTOR IOL replaces the natural lens. It has a patented optic design using apodization, diffraction and refraction technologies. The apodized diffractive optic design gives it the ability to focus light correctly on the retina for images at various distances. Standard artificial lenses (monofocal) correct vision either for distance or near vision, not both. As with any surgical procedure there are inherent risks, and your results cannot be guaranteed. Dr. Jensen will provide you with more detailed information about the potential risks and benefits to help decide whether cataract surgery and the AcrySof® ReSTOR® IOL is right for you. After ReSTOR implant surgery, it may be necessary for some people to wear glasses for distance, intermediate and/or near vision to obtain optimal visual acuity. 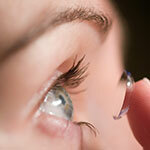 The difference is that most people with the ReSTOR lens will NOT be dependent on glasses to live normally.